Insurance. If nothing unexpected ever happened, no one would need it. Unfortunately, the reality is that unexpected things do happen, and when life drops emergencies, misfortunes, and disasters, it’s nice to have a promise backing everything up. And at its heart, that’s exactly what insurance is: a promise. Of course, it’s also a bit more complicated than that. As an insurance provider, you know that insurance works on the principle of risk. How likely is it that a particular problem will occur? How much will it cost to cover a claim in the event that it does? Based on a complex assessment of available liability and cost data, you offer your customers coverage customized to their unique needs and situations. And, in order to do that, you need a lot of information. There’s a lot depending on insurance. For the policyholder, the right coverage could mean the difference between riding the waves of misfortune or being drowned by them. For the insurance provider, properly managed insurance claims help build client trust while also protecting the business from fraud and error, and are invaluable in establishing a foundational reputation of dependability in an increasingly competitive industry. So, to provide coverage that is effective and legal, you need to make sure that you’re dotting all of your I’s and crossing your T’s. That means paperwork. Lots and lots of paperwork. After all, before you can authorize any insurance payments, you want to be sure that the money is going to the right place, and that’s only the tip of the iceberg. How detailed? Very detailed. This goes well beyond the basics of full names, birth dates and home addresses. You’ll also need family information, social security numbers, employment status and history, health history and lead information. And if you plan on building an actual relationship with your customers, there are less-vital details that may be worth documenting. Anniversaries, the names and ages of everyone in the home, hobbies and more can all be useful for establishing a friendly rapport. Simply put, you should be tracking and maintaining almost any available details (within reason, of course) related to your policyholders. It may seem obvious, but it’s worth mentioning that knowing your clients isn’t enough; you also need to know how to contact them. There will likely be times when you urgently need to get in touch with a policyholder. Do you have a current phone number? What about a secondary phone number in the event that the primary phone number isn’t going through? Also, given the wide range of communication media currently available, you’ll want to keep track of how your customers prefer to be contacted. Are they more likely to respond to a text message or an email? Do they appreciate being contacted via traditional mail, or would they prefer that communications be paperless? Keeping detailed files on contact information as well as contact preferences will ensure that you’ll be able to get through when you need to. 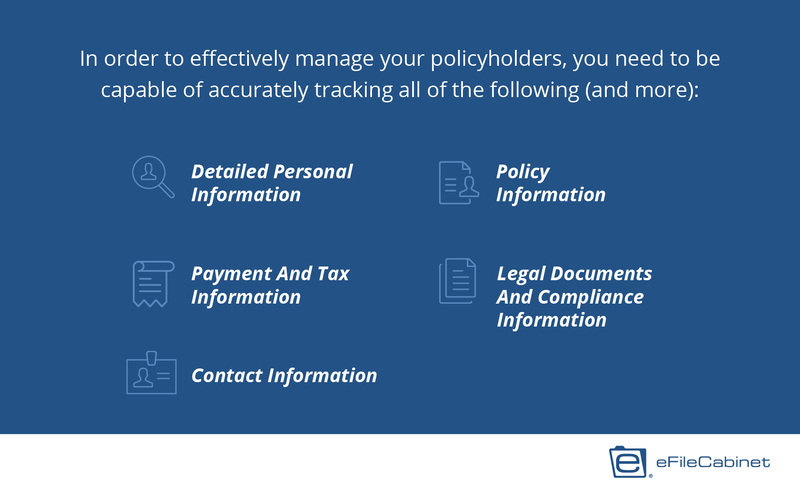 With the personal details all in order, the next step is to make sure that the policy details are likewise organized. Otherwise, you could be creating even bigger problems for yourself and your customers (at times when more stress is the last thing anyone needs). Detailed policy data consists of policy numbers, relevant dates (effective dates, term date and renewal dates), coverage type, agent, account manager and current status. Your insurance business is, after all, a business. And as a business, it needs to be able to maintain and retrieve detailed payment and tax information. This includes, but is certainly not limited to, payment details (card numbers, history, bank accounts, etc. ), policy holder beneficiaries, pending payments, photocopies of checks, bank statements, receipts and accounting records. Also, recognize that this applies to payment information for both your customers and your business. 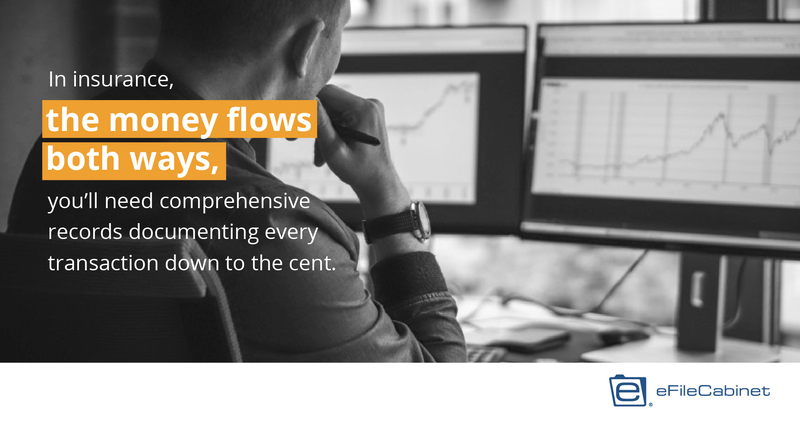 In insurance, the money flows both ways, and if you don’t have comprehensive records documenting every transaction down to the cent, then you could find yourself in a difficult place. Many of the claims you receive likely involve legal issues that you’ll need to account for. As such, relevant information in the form of court documents and other legal documents should be recorded and organized for easy retrieval. And speaking of keeping everything legal, as an insurance agent you’ll be expected to keep up to date on all laws related to compliance, licencing and certificate data. And, you guessed it, that means even more related documentation for you to file. On top of everything, it’s your responsibility as an agent to ensure that the information you have on record is up to date. Otherwise, it’s not going to be doing your customers, or your business, any good. How much time do you spend looking for internal information? Well, if you’re anything like the insurance industry average, then the answer is one day out of your week. Just to be clear, that isn’t saying that you only look for internal data once a week; it means that if you were to add up all of the time you spend hunting down documents and details, it would end up accounting for 20% of your total work hours (or one entire workday in a five-workday week). Does that seem like a lot? It is. And it really adds up. 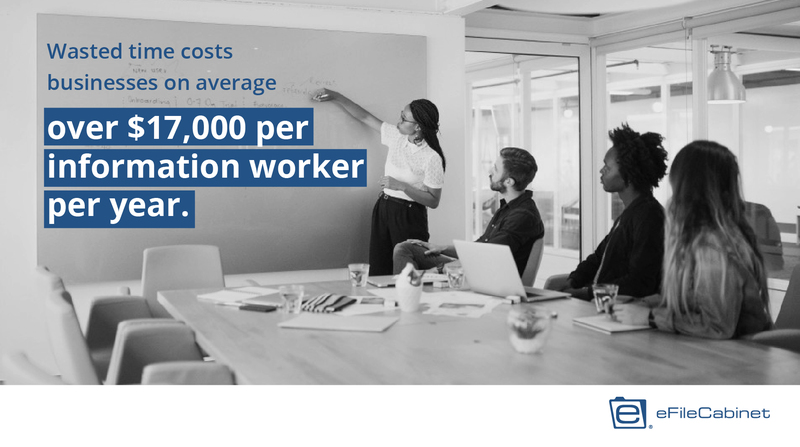 Wasted time costs businesses on average over $17,000 per information worker per year, and it only gets worse should anything happen to that information. 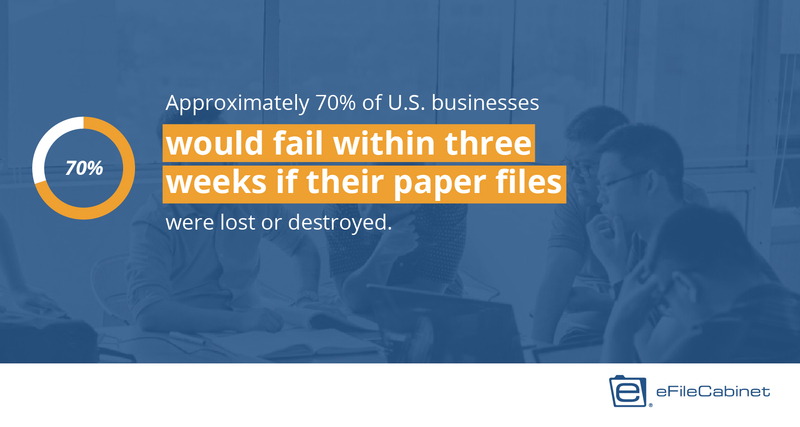 It’s been reported that approximately 70% of U.S. businesses would fail within three weeks if their paper files were lost or destroyed. The bottom line is that your insurance business depends on the quality and accessibility of your data management. So, you should ask yourself: How secure to do you feel with your current filing system? If your answer is anything less than “unshakably secure,” then consider insurance document management software from eFileCabinet. eFileCabinet is document management software perfectly suited to the needs of insurance agents. Combining automation, searchability and centralized data, eFileCabinet offers solutions that are as accurate as they are accessible. Built-in metadata tools make it possible to tag documents, making them easy to locate whenever you might need them. Quick, automatic naming structure ensures consistency (and helps prevent issues related to inaccurate file naming). Detailed access restrictions and ownerships keep information from falling into the wrong hands, and the eFileCabinet SecureDrawer feature empowers users to send and receive large or sensitive files fully encrypted (rather than through less-than-secure email accounts). Powerful mobile apps offer agents the freedom to interact with files while on the go. And, if the time comes to transfer ownership to another agent, eFileCabinet ensures that none of the vital insurance information gets lost in the cracks. Insurance is a promise, but without the right insurance document management software, it’s a promise that takes a lot of time and money to keep. Check out eFileCabinet today, and bring some much-needed insurance to insurance document management.